16/3/10 – Art market – Maastricht, Tefaf – Will the Maastrich Art Fair which just opened finally signal a recovery ? The delighted faces of the dealers here, fully satisfied with sales which started on the first day would seem to indicate it. The buyers are back, especially Americans. We must say that the 2010 edition is of excellent quality, perhaps even better than last year’s. Although some of the works were already seen at previous Tefafs or recently on the art market they have often been restored, acquired new frames and are thus enhanced, acquiring a new luster. This is the case for a painting by Michel Dorigny (ill. 1) which was on offer for a long time at Eric Turquin’s and has been rejuvenated by the Dickinson Gallery : returned to its original size, cleaned, nicely framed, its aspect has been entirely transformed . 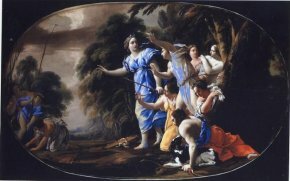 Despite the fact that the artist’s limits–Dorigny is not Vouet–can be seen in some of the secondary figures, the central scene is remarkable. It is unfortunate that the Musée du Petit Palais did not acquire it from the Parisian gallery since it already owns two other elements from the same décor on the theme of Diana . We should say in passing that French museums’ limited means and the obstacles they face in saving our national heritage is obvious just about everywhere at the fair. 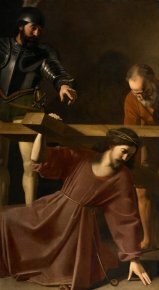 A great many of the important works sold recently at auction in France (or elsewhere on the French market) can be seen here as proof, such as the magnificent Christ Bearing His Cross by Nicolas Tournier (ill. 2) at Aaron’s, also an element of a larger décor with other known parts held at the Musée des Augustins in Toulouse. Or the superb Saint Sebastian by Charles Poerson (ill. 3), auctioned at Drouot (Piasa) on 26 June 2009 and presented here by Haboldt & Co. Its probable provenance, the church of St. Germain-l’Auxerrois, and its quality deserve that it go to the Musée Carnavalet, but this museum, like the Petit Palais mentioned above, has not had funds available for such an important acquisition for a long time as national heritage and its museums do not seem to be high on the list of priorities of City Hall in Paris. At least fifteen or twenty of the paintings on display would be a welcome addition to the Louvre, at times by artists which are not represented there. For example, among English painters, one of the very few areas outside of France in which the Louvre still purchases extensively and quite soundly , there is the extravagant James Ward representing Ignorance, Envy and Jealousy at French’s who had already shown it last year. 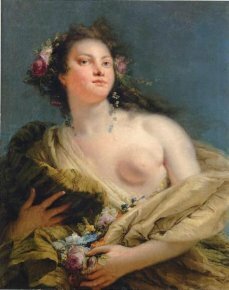 In the field of 17th century Italian painting, for which, unless we are mistaken, the last purchase dates back to 2003 (see news item, in French, of 16/5/03), there are countless numbers of canvases which we would like to see in Paris. Northern painting of the Golden Age is another area sorely passed over for acquisitions by the Louvre. There are many here at Maastricht of extremely fine quality. 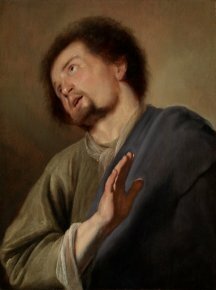 We will provide only one example, Jacques des Rousseaux, a Dutch painter who was very close to de Lievens : his Apostle displayed by Clovis Whitfield (ill. 4) is a veritable masterpiece. Among some of the very important objects, there is the Baptism of Christ by Nicolas Poussin, again at Dickinson’s, one of the most beautiful stands at the fair, and the exceptional Portrait of a Woman as Flora by Giovanni Battista Tiepolo (ill. 5), auctioned at Christie’s London in December 2008 and subtly restored, now presented by the Jean-Luc Baroni Gallery (another masterpiece which left France due to powerless museums). For those art lovers who were not able to see the Agostino Tasso retrospective in Rome in 2008, the Canesso Gallery presents a small monographic exhibition of seven paintings by this artist. 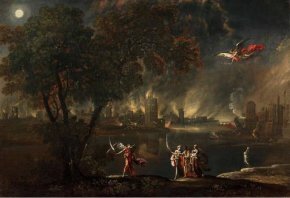 We offer a reproduction of Lot and his Daughters Fleeing Sodom (ill. 6) with an illustrious provenance from the Barberini family. Well known artists were not the only ones to paint masterpieces. 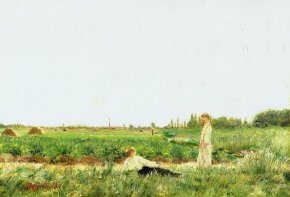 There are also some remarkable paintings by less famous names, at times even totally unknown. Jacques des Rousseaux falls into this category. 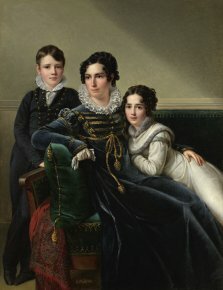 At the Eric Coatalem Gallery, instead of turning our attention to the Jean-Baptiste Oudry, one of the most famous paintings by this artist, or to the unpublished, and exquisite, Visitation by Laurent de la Hyre (two canvases sold as soon as the fair opened), we would like to point out the very beautiful family portrait by the Belgian, François-Joseph Kinson (ill. 7) who was Joseph Bonaparte’s artist in Cassel. 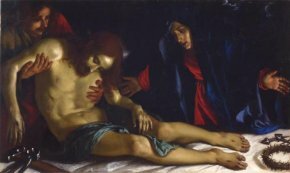 At G. Sarti’s, special notice goes to the Pietà by the Florentine painter, Agostino Melissi (ill. 8), a very moving work with an impeccable Medici provenance. The Stair Sainty Gallery offers a very small Jean-François Raffaëlli (ill. 9) proving once again that this painter, who exhibited alongside the Impressionists, is still underestimated and at Schlichte Bergen visitors can see a Portrait of a Man by a Dutch artist with a French name , probably a descendant of a Huguenot emigrant, Jean Grandjean (ill. 10). 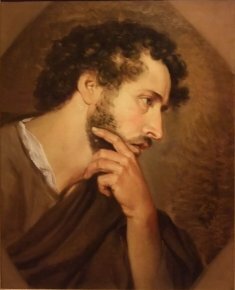 Practically unknown, dead at an early age, he attended the Académie de France in Rome at the time of David’s stay there. There are fewer examples of sculptures but here Daniel Kantz stands out with, notably, two Italian Baroque marbles by Giuseppe Piamontini auctioned off last year at Drouot and which we regret, once more, were not acquired by the Louvre. 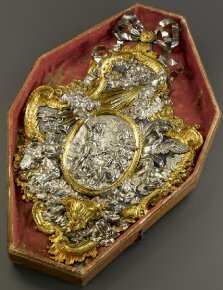 We would also mention two Baroque objects which are rather extraordinary. 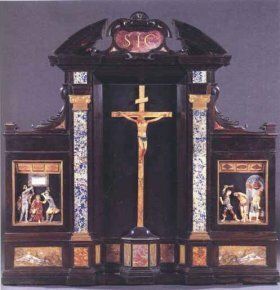 The first, belonging to an Italian gallery, Altomani & Sons, is a small ebony and fine stone altar produced in the late 17th century ; the sculptures are of different periods, the lateral reliefs attributed to Francesco Mochi and the Crucifix to Giuseppe Antonio Torricelli (ill. 11). The second is a portable holy-water basin in silver and gilt bronze signed by the silversmith Giovanni Antonio Fornari, with its original leather case, on offer at the Kugel Gallery (ill. 12). 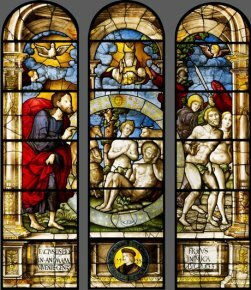 Our article concludes with a large stained glass window which left France in the early 20th century and is originally from the church of Saint Firmin in Flavigny sur Moselle, Lorraine (ill. 13). Three other smaller windows from the same church are at the Metropolitan Museum. This work, presented by the Sam Fogg Gallery should benefit from the law for national treasures held abroad so that a patron could acquire it for a French museum ; why not the Musée de la Renaissance in Ecouen for instance ? Given its extraordinary quality, the price of 4 million euros seems reasonable. Although it is always legitimate to wonder if a painting should be returned to its original size since enlargements are an integral part of the work’s history, in this case we can only approve as this has served to reinforce the composition itself. A fourth one is in a private collection in Dijon, the whereabouts of the last one are unknown.